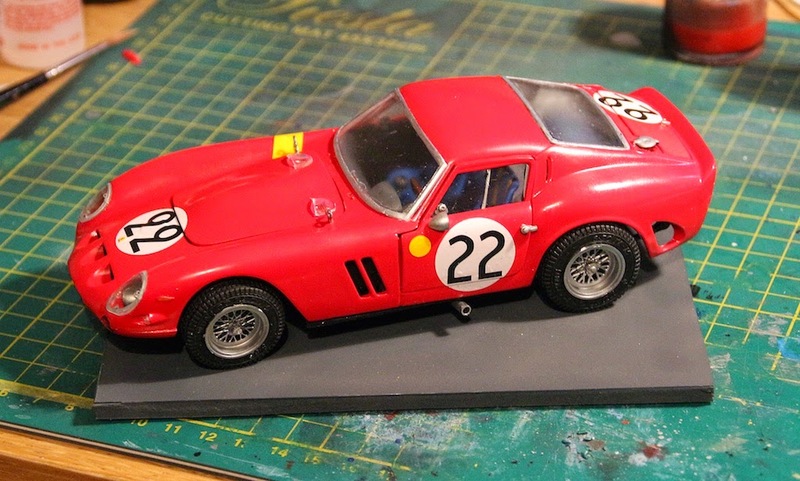 Gentle Scale Modelling: Ferrari 250GTO finished - almost! I have managed to get the GTO to a point where I can take it to the club tomorrow night. However, it has not been without drama. I am left feeling a bit disappointed with it as a model but, as my old friend Aaron used to say, it is very good as a four foot model - i.e. look at it from four feet away! I will intersperse the photos amongst the description. Firstly, the nose. It doesn't look too bad from here. The fun came when I realised that I had left the chrome insert out of the nose. The nose itself is in two parts. I had a go at sliding it in but I couldn't get it to go in correctly. 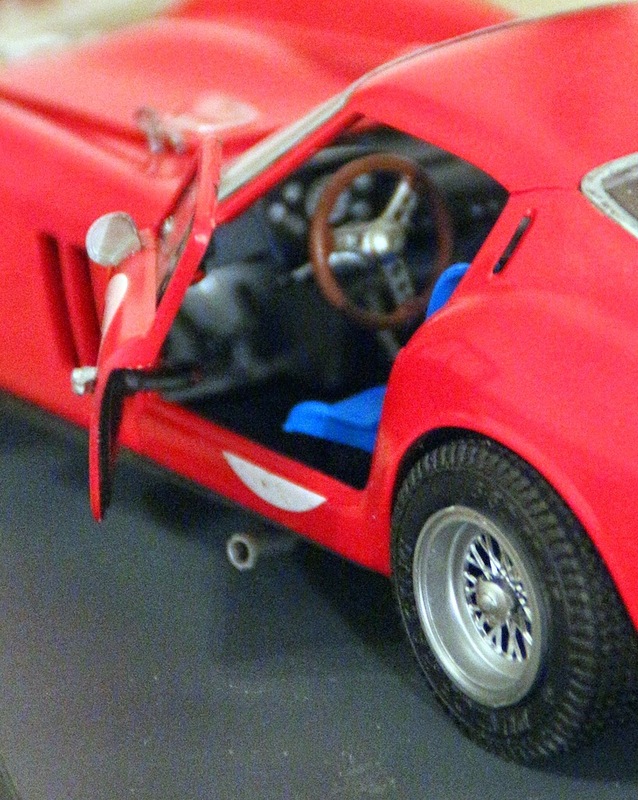 Thus, the nose that I had carefully filled in the joins and resprayed had to be pulled apart. I got it apart without too much damage and got the nose cone in place. As you can see, it had to go in as it gives a mount for the chrome Ferrari badge. I never did get the joint quite back as it was before :-( Before I fitted the chassis to the body, the bonnet sat perfectly. Now that the chassis is in, one of the air breathers on the engine sits a bit high and the bonnet now doesn't shut completely. Don't you hat that sort of thing as there is absolutely nothing that can be done about it. Now to the right hand side. 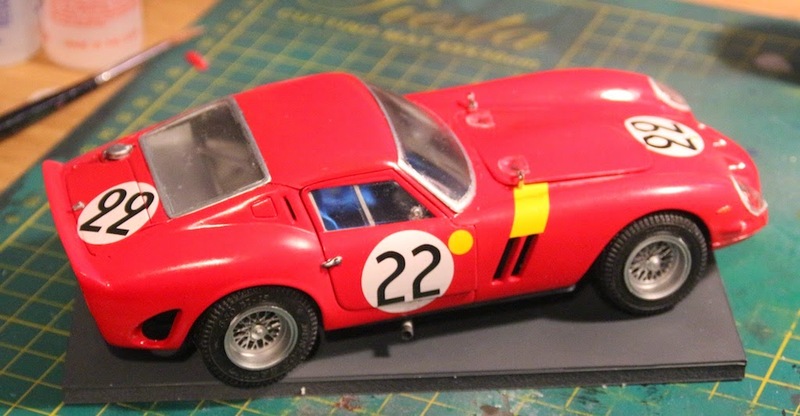 This looks fine in the image but I have managed to damage the yellow decal. Either side of the bonnet (hood) there are catches that hold it down at race speeds. These are dropped through and moulded over using a heated blade so that they can be lifted and turned.Whilst trying to get the right hand side one to turn, I scraped the yellow decal so that there is now a red patch. (I have photoshopped that out for now!). After Clacton, I plan to mask out the yellow and re-spray it, although the new yellow is unlikely to match that on the door patches. Also, the right hand side front suspension was too high making the car sit on three wheels and look strange. The kit has sprung suspension using little metal springs. I managed to fit the front ones but never could get the back two in place so left them out. I wish that I had left them out of the front as well. I got both springs out OK using tweezers and now the car sits properly. No real problems here except that there is an issue that comes out of the way the rear lights have been moulded. The top light is an indicator and is painted transparent orange. The middle is a brake light (?) that is painted in transparent red. Both of these fit over moulded pips on the body so the transparency really doesn't show - you see more of the red of the bodywork. The bottom light is moulded to fit into a slot and has no plastic behind it. The transparent red shows up really well here so the two red lights look different! Now to the left hand side. The inside. It is tricky to get a good photo when hand holding the camera so I will get a better image tomorrow night when I have my tripod fitted. 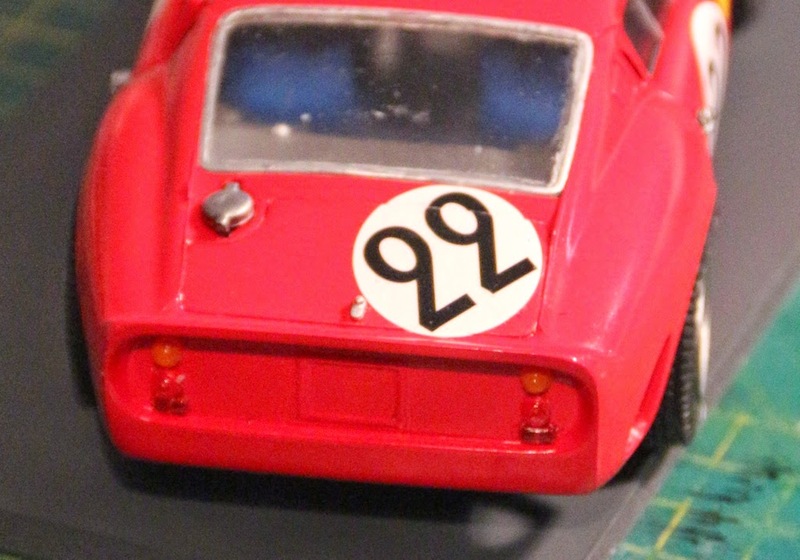 It was fun fitting the decals to traverse the door panel and on to the body. I had to do the same on the bonnet and the boot. 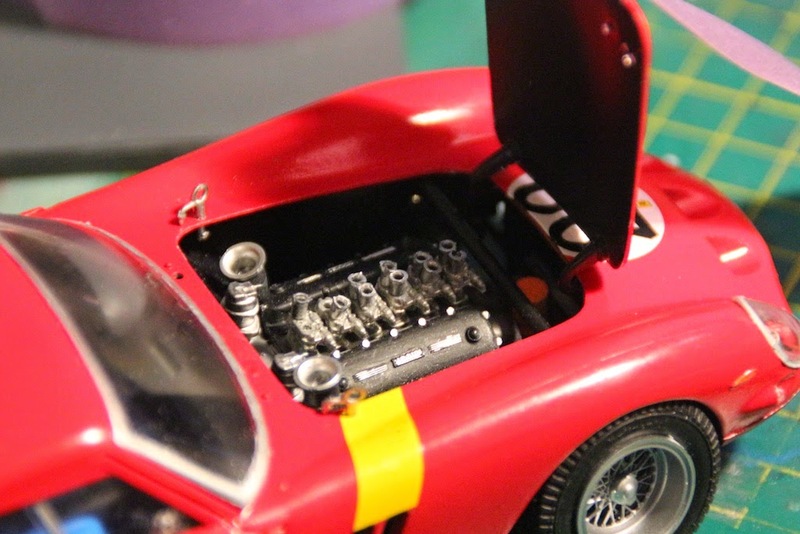 Lastly, here is a shot inside the bonnet. The bonnet lid doesn't stay up so I had to hold it in place with some masking tape. 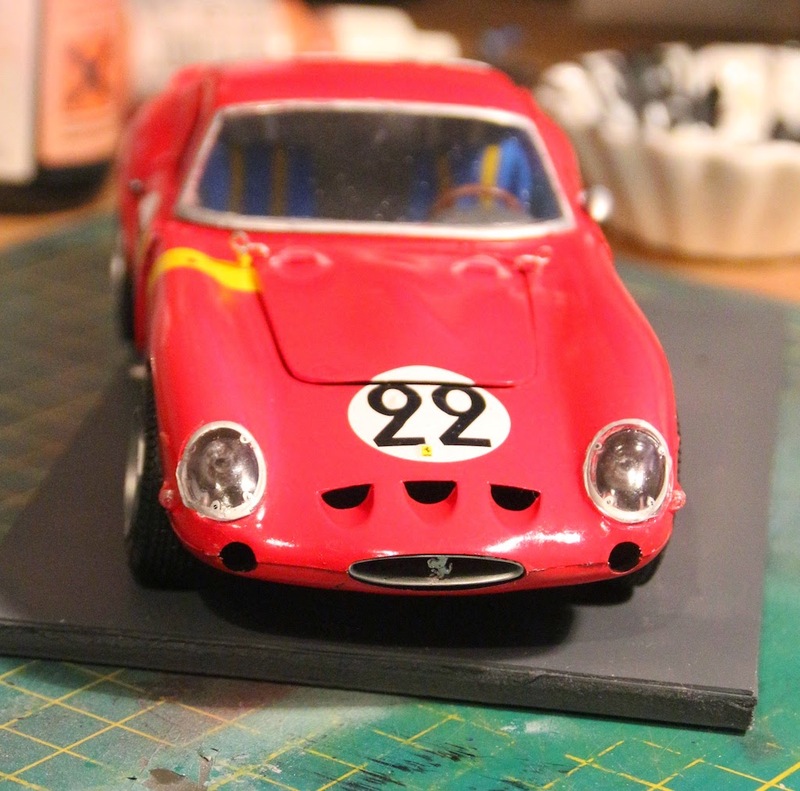 Overall, I have enjoyed making this kit but it is very fiddly and building around a highly polished red body has not been fun. It's a nice one for the collection, though.